Tonight the Detroit Tigers will step onto the field in San Francisco for the 11th World Series appearance in franchise history. Their first Fall Classic berth was in 1907 and the most recent, prior to tonight, was in 2006. Each and every pennant winning club has sported a common visual hallmark—the home uniforms have all featured the Tigers' iconic Old English "D."
The Tigers' "D" first appeared on the road jerseys, in 1904. The following year, 1905, the "D" graced both home and road jerseys. The D has morphed over years and has even disappeared on occasion, most recently in 1960. 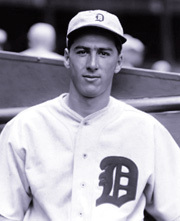 Tiger greats from Ty Cobb to Hank Greenberg to Al Kaline have all played in the World Series wearing the Old English "D," and they will be joined by Triple Crown winner Miguel Cabrera on Saturday night in Detroit. The classic "D" was first used 5 years before the Yankees introduced their interlocking "NY" and 13 years before the Montréal Canadiens' classic logo was born. Detroit's population is half of what it was 40 years ago, but the Tigers' iconic symbol, like the city itself, endures.